Gundam is a multimedia action series about giant robots that spans anime, manga, models, toys and even video games. These giant robot fighters battle each other on alien planets and in space with weapons ranging from laser guns, to bazookas, to swords and shields. Due to the complexity of these giant robots, illustrating a Gundam may seem like a difficult task. However, if you simplify the robot into its most basic shape you can add details later. This will allow you to create the correct proportions and keep the illustration realistic. Add the arms and legs with straight lines. Add elbow, knee, and hand guidelines with small circles. Place the elbow circles about three-quarters of the way up the arm. Place the hand at the end of each arm. Add the knee about three-quarters of the way up the leg. Draw the left-hand side foot with square and the right-hand side foot with a long, thick triangle. Add the upper arms and forearms with rectangles around the arm guidelines. Draw long ovals around the upper leg guidelines. Add the lower legs with a long oval on each leg that dips in at the middle like a figure eight. Add a "V" shape on the forehead of the face. Draw a small square inside the face circle. Add two small upside down triangles inside at the top of this square for the eyes. Add a small diagonal rectangle coming out of the base of the head for the chin. Draw the ear unit with a square on the left-hand side of the face. 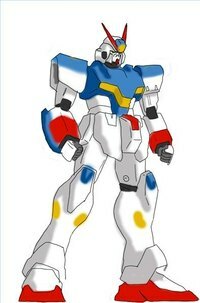 Draw a large "V" on the chest of the Gundam. Erase any overlapping guidelines and keep only the pencil lines that you want in the final picture. Ink the entire picture. Let the ink dry and carefully erase the pencil lines. Color the top of the shoulders and chest blue. Color the "V" antenna red as well as the chin rectangle. Add large red bands on the bottom of the forearms. Color a large band of red at the bottom of each foot. Make the "V" in the center of the chest yellow. Add a small square of yellow in between the red "V" antenna. Color the hands dark gray. You can add shadows with darker versions of the same color you are using. For instance, if you are adding shadows to the blue chest, use a darker version of blue to create this effect. Be sure to let the ink dry before erasing the pencil or you could smear and ruin your picture.